logo done by sensenstahl :: vote for the logos you like and be a lamah ! absolutely lovely effects & music! Rulez! but also: I do like the pace very much. Good stuff, cool fx & msx, nice gf8 (as always) from Sim1 (good U R still around Pal). Easy thumb of coz! wow!! fabulous! a real gem for the platform. Wow! The NES is rolling over in its grave. Oldskool in a proper manner. Delicious. Excellent production. Great pacing, cheerful ambience, solid effects. Lovely demo, nice graphics, good music, interesting effects and transitions. Well done! Wow, great SMS demo, great colors, effects, shows the power of SMS. Ruling the SEGA Master System scene! Very nice SMS prod and as usual great gfx from sim! Short and sweet, I really like. Yes! Great to see some more SMS prods. Cool effects and great tempo! 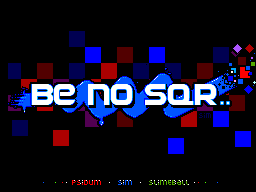 The Sega Master System just got the demoscene love it deserves, great prod! psidum, and this all for z80? splendid! wish it went on some longer! rulez added on the 2016-05-04 20:48:04 by ɧ4ɾɗվ. Wow, this was a pleasant surprise! effects, pixels, sound, awesome prod. Great demo on my favourite console! Great prod! A bit short. Youtube link was changed to buggy emulator capture. Hardware capture can be found here: https://www.youtube.com/watch?v=0i0ZkaHOvE0. Check out real hardware or Emulicious for 50 fps. Very nice demo, thanks for supporting Master System. page created in 0.016830 seconds with 15 queries.